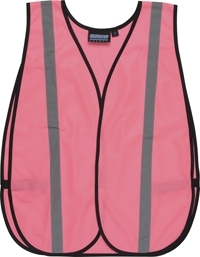 100% polyester tricot traffic vest with reflective silver striping. Also features durable elastic side straps. Great for women at work, visitor identification, benefit walks and jogging. One size fits most. Please be aware, this is a Non-ANSI work vest, but great for sports and non traffic activities that do not require a class 2 or class 3 work environment requirement.